Amano's rendition of FFVI's world revealed a far grander and more fantastic vista than the humble Super NES was capable of rendering. COVER STORY: The artist who has given life to so many Final Fantasy games speaks about his inspirations, the difference between fine and commercial art, and his current projects. "The first time I saw — or rather, noticed — Yoshitaka Amano's work was when I stumbled across the Nintendo-published U.S. strategy guide for Final Fantasy VI, back when we in America thought it was actually the third Final Fantasy..."
"... It stood out from shelves by avoiding the hypertrophic musclemen and garish explosions typical to 16-bit American game packaging. In their place instead appeared a delicate, almost impressionistic rendition of a young woman with flowing hair reclining in the cockpit of a gnarled, angular machine. 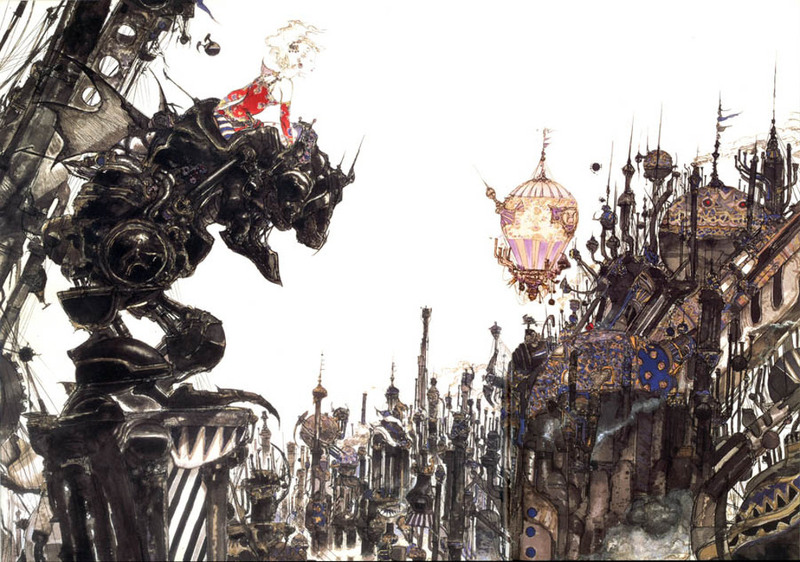 Despite the cover illustration being largely obscured by a huge red block from which the book's title screamed in shiny gold letters, I recognized the subject of the painting immediately: This was Terra perched atop a Magitek Armor, an artistic take on Final Fantasy VI's stunning introduction in which we meet the story's central character as a brainwashed servant storming through a mining town atop powerful armor in service of an imperial army. "